It was always a pleasure and an honor to visit with Joan Sebastian during his many visits to Exclusive Timepieces. Many times Joan would spend hours visiting with us, and tell us the meaning of some of his most famous songs. 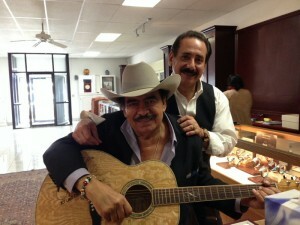 During this particular visit he signed and dedicated this guitar to my son Fabian, and sang for us a very sentimental song titled “Eso y Mas”. Joan was a 7 Time Latin Grammy Award Winner, and 4 Time Grammy Award Winner, he was one of Mexicos finest composers. His visits to Exclusive Timepieces and talents will be greatly missed. May he rest in peace.